Lead by Example is a non-profit organization created in October 2010 to promote educational opportunities for children in Haiti. The educational system in Haiti is quite expensive, so Lead by Example provides tuition assistance to increase access for Haiti’s children. The country is trying to rebuild itself after the crushing 2010 earthquake that devastated one third of its territory. This is a challenge since Haiti has the lowest per capita GDP of any country on the American continent. After witnessing the damage and living conditions first hand, Louvenor decided to give back to his childhood home and founded this charity. The Foundation now helps provide tuitions, uniforms, books and supplies to over 180 children between the ages of 5-18 year old. These children would otherwise not be able to attend school due to the overwhelming expense on their families. 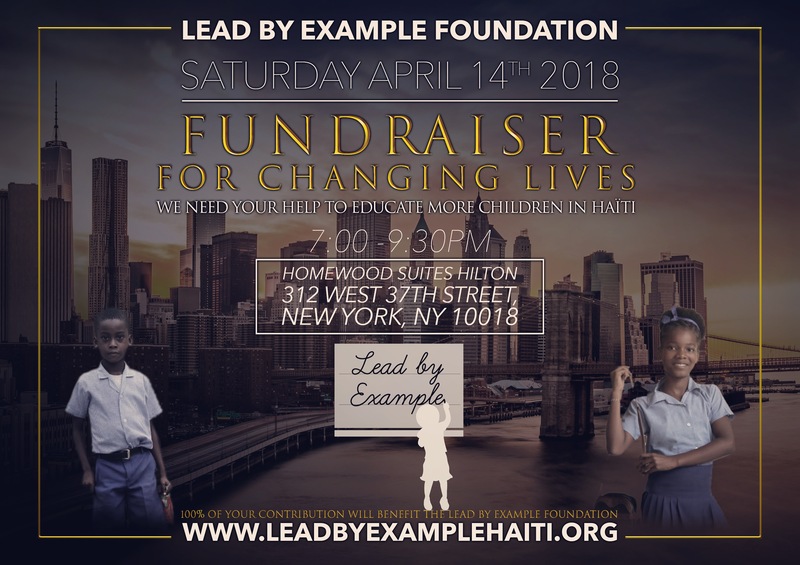 The Lead by Example Foundation was started by Bob Mackey after he traveled to Haiti with Louvenor and donated his time helping the people of Haiti. The Foundation was created in January, 2017, as an approved 501c3 USA charity. Louvenor lived with the Mackey & Riveria family in Virginia Beach Va. as a H.S. exchange student athlete in 2000. Please come and join us on Saturday, April 14, from 7pm to 9:30pm, for a fun filled & educational evening to open your eyes to the work Lead By Example does and how you may help. Come enjoy the Manhattan rooftop view from the Homewood Suites Hotel, close by Madison Square Garden, with your family or friends. Lite appetizers & soft drinks will be served and beer & wine will be available.